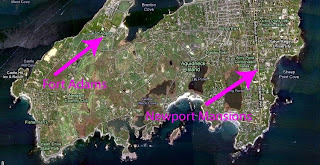 Continuing our tour along the coastline of Connecticut and Rhode Island, we now come to the town of Newport, located on an Island in the Rhode Island Sound. Say "Newport" to a native Oregonian like myself and I immediately think of the Oregon coastal town, Mo's world famous clam chowder, and the obligatory stop at Mo's for any presidential candidate. It turns out that there are other Newports. Lots of them! And actually the most famous of them is probably Newport Rhode Island. 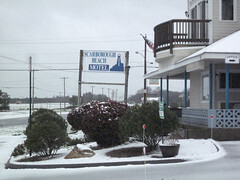 After clearing the snow off our car in Narragansett and having a hearty breakfast at the nearby Olde Lighthouse Diner, we headed east to Newport. We first drove out to Fort Adams. Since 1954 this has been the site of the Newport Jazz Festival. Every jazz fan has a favorite song or two that was recorded there. We drove by the Eisenhower House on Fort Adams which served as the Summer White House in 1958-60. Ike found it conveniently close to the Newport Country Club. 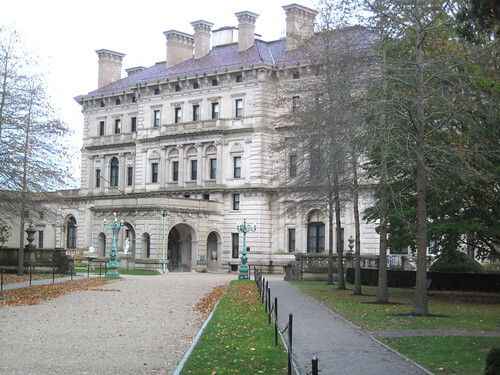 But the highlight of Newport is the "Millionaire's Mile" of mansions on Bellevue Avenue. Unlike many clusters of mansions, these are quite visible from both Bellevue and along the backside via a hiking trail know as Cliff Walk. Since it was raining and the temperature was around 40 degrees, we left the walk for our next trip. But we did tour two mansions. Both of them were Vanderbilt properties. When you are in Rhode Island the second person you are likely to be reminded of after Roger Williams is Harold Vanderbilt. And why not? 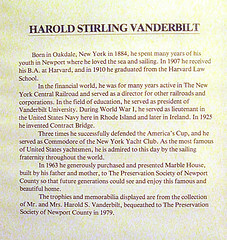 Yachtsman extraordinaire, developer of the scoring system for contract bridge and active member of the family railroad empire, he was a rather prominent citizen of the tiny state. 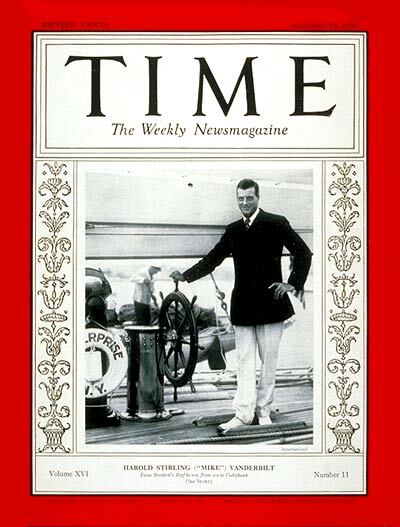 Here we see him on the cover of Time magazine for September 15, 1930. 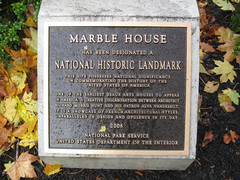 The Marble House was our first stop. While only a "summer cottage" built by William Kissam Vanderbilt, the home is notable because of its ostentatious construction and decor. 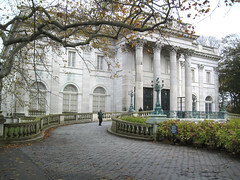 Marble House also was home to W.K. 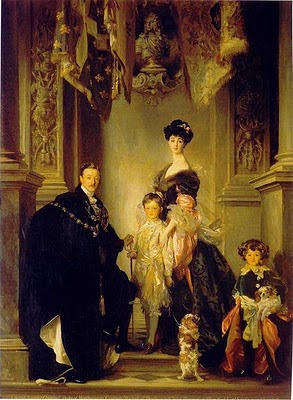 Vanderbilt's two famous children Consuelo and Harold (mentioned previously.) Consuelo was coerced to marry into the Spencer-Churchill family in England and brought along enough money as a dowry to refurbish Blenheim Palace. Consuelo was famous for her graceful swan-like neck. The Marble House thoughtfully preserves the neck stretching apparatus used on her. 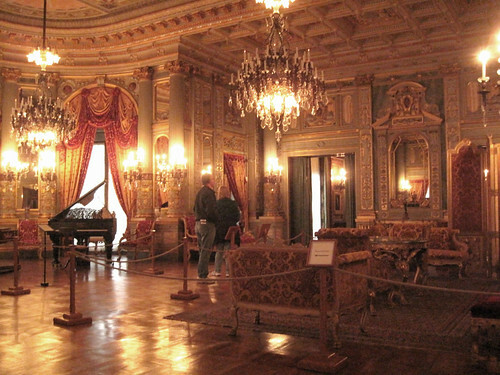 About a mile away from Marble House is The Breakers, the top dog in Newport Mansions. 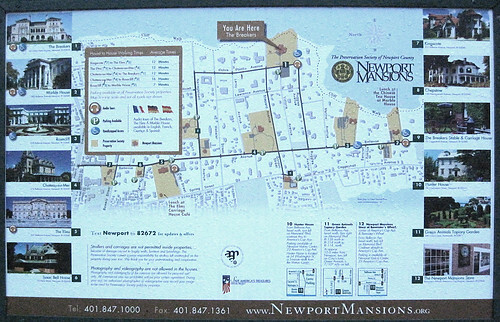 Like the other mansions in Newport open to the public, no interior photos are allowed. This is "to preserve the historic property and prevent damage." I assume this is because of the belief that taking a photograph will steal the soul. I did take a couple of interior shots anyway. Unfortunately, the Japanese couple in front of us took a flash photo early in the tour. This put a young docent hot on their tail and made it difficult for me to get my shots. Darned amateurs! Well, here are a couple of shots of the interior, anyway. 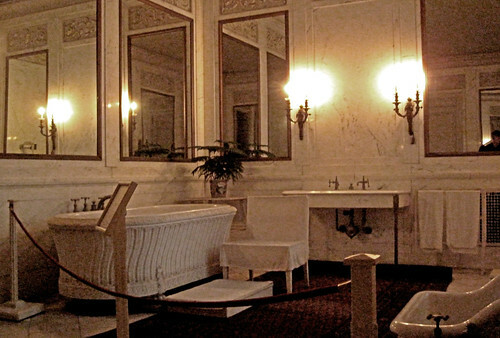 The marble bathtub required filling with hot water several times to warm it up. It is always worth reminding ourselves that we all lead lives today much more comfortable than the Vanderbilts thanks to the progress of technology. Just as an example, Harold Vanderbilt died at age 51 following complications from an appendectomy. 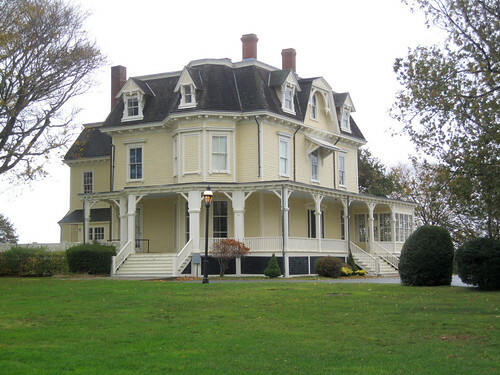 Continuing our Sunday drive along the Connecticut and Rhode Island coast, we soon reached Westerly. 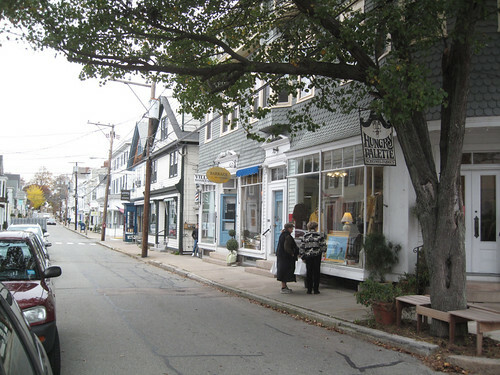 Westerly lacks the "quaint" and "cute" of some of the towns in the area but has a very nice antique shop in Mary D's. I picked up a 1909 Rhode Island Manual. Election results for every town, a great state map etc., all for $2. 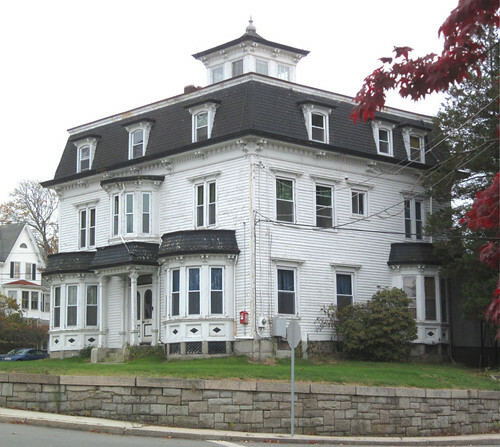 It was easy to tell we had crossed into Rhode Island as we passed the Roger Williams Inn. 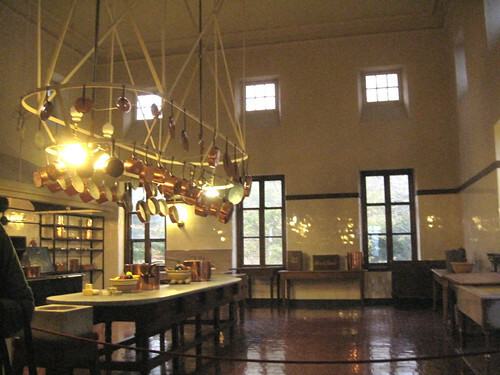 The Inn is not terribly historic since it was built in the 1880s and Williams founded the Providence Plantation back in 1636. Still it is an interesting looking place and available to "the savvy investor" according to this site. We continued our leisurely journey along the coastline on scenic US 1 to Narragansett. I understand that in the summer, this drive can be more than just leisurely. Bumper to bumper is the oft-mentioned description. Late autumn might be the ideal time to visit. 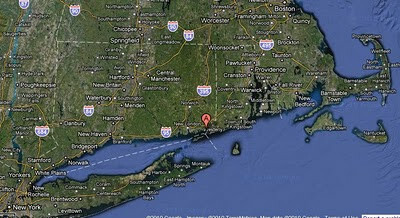 Once we reached Narragansett, we headed south to Point Judith. 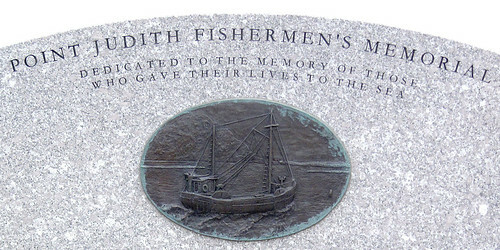 As in many towns in this area, there is a memorial to the men who have lost their lives in the sea. 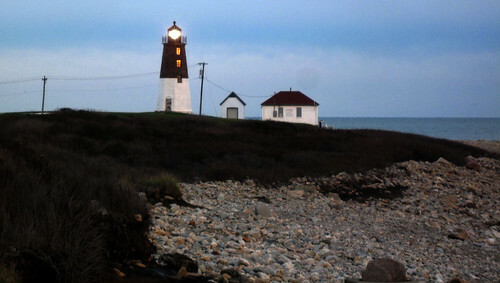 And, there is another light house. This one is active. By this time, we had finished the day and watched the sun set. We spent the night in Narragansett. I though I'd take a picture of the beach and ocean the next morning. When I went outside, though, much to my surprise there was about a three-inch covering of wet snow! 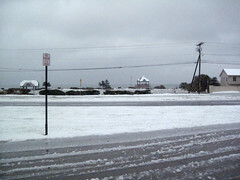 But, while I have beach pictures and snow pictures, this was my first chance to take a snow-beach picture. 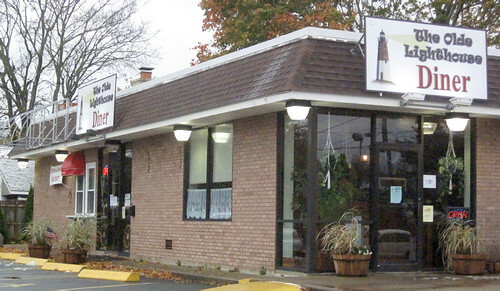 We headed over to the nearby Old Lighthouse Diner for breakfast. There we had a great breakfast, good value, and pleasant conversation with the owners. It was nice enough that we came back for dinner. 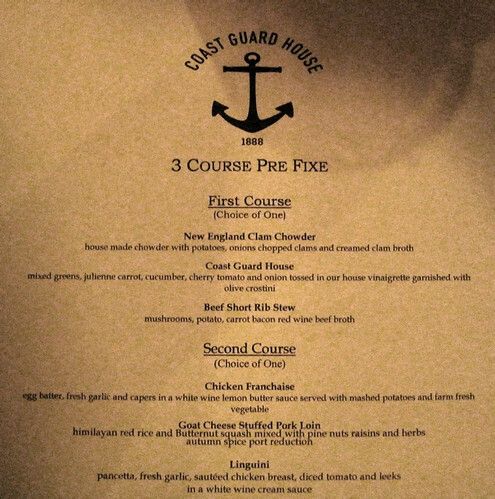 I'd rate the food as superior to The Towers, Narragansett's fancy dining spot on the beach. Got to give the view from The Towers the edge, though. And the food prices aren't out of reach there if you choose from the "Pre Fixe" menu. Pre Fixe??? Well, just pretend it says Prix Fixe! We had only been in Connecticut for about five minutes when I heard the first suggestion that we should visit Mystic. I had stopped at the first travel information stop that we encountered along I-95 after leaving New York. After that, it was common to hear the question, have you been to Mystic? 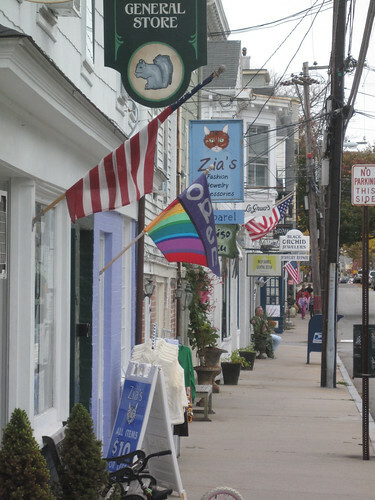 Mystic is a small town on the Connecticut coastline but it also refers to an area along the coast. 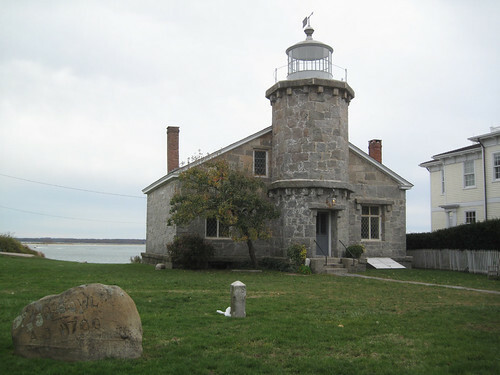 The drive along the coast from New London / Groton through Stonington, then into Rhode Island's Westerly, Narragansette and Judith Point is only about 40 miles. It is easy to spend the whole afternoon exploring these towns, though. 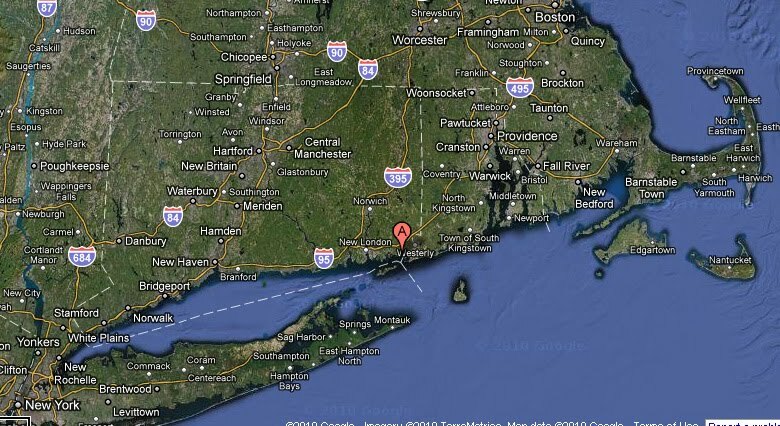 Here is the broad view of the area from New York to Boston. The letter "A" is at Stonington. This closer view covers just the area from New London / Groton to Newport. 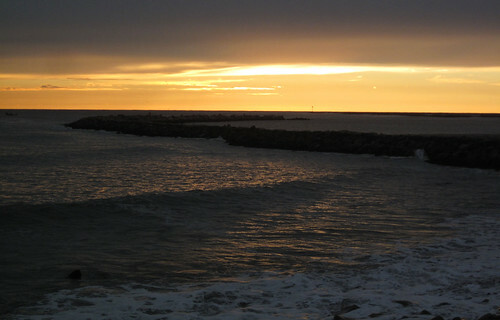 Newport, is going to have its own blog post, later. We visited this area on a chilly Sunday morning, November 7th. 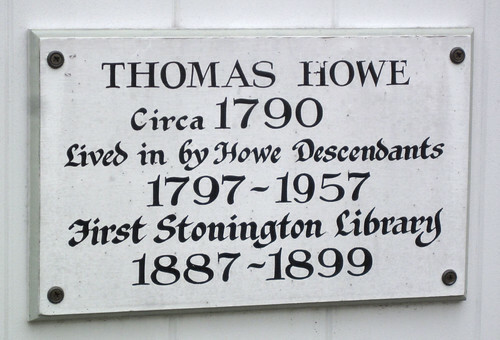 Like most of the little towns in the area, Stonington has its origins as a fishing village. 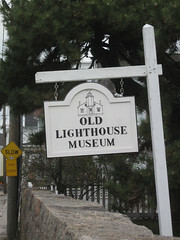 A narrow road takes you through town and out to a point with a lighthouse, one of many in the area. The town is worth stopping for a walking tour. We stopped in at the Water Street Cafe for an excellent brunch after visiting the old lighthouse on the point. 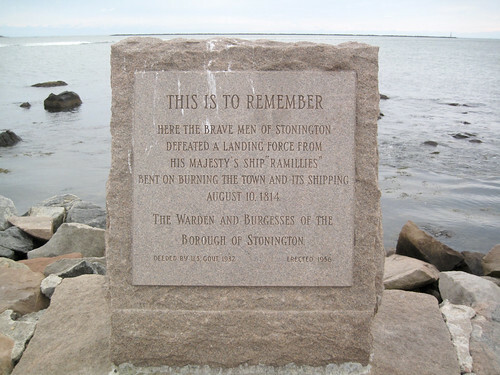 During the War of 1812, the British stopped by to make a major attack on the town. A suitable memorial marks the spot.